Sustainable Water Resource Management in the Sundarban Biosphere Reserve, India. The Sundarban Biosphere Reserve (SBR), India lies in the tide-dominated southern part of deltaic West Bengal and supports 4.43 million strong populations. Freshwater is a scarce resource in the SBR though it is traversed by numerous creeks and rivulets and receives a huge amount of precipitation during the monsoon months. Scarcity of freshwater above and below the ground during the dry season and high salinity of soil and water make it very difficult for the people of the SBR to secure their livelihood. The present paper assesses these sectoral demand and availability of water in 19 administrative blocks of the SBR. Increasing water demand of the ever-increasing population leads to water deficit in most of the blocks during dry season. In this study, the annual demands of drinking and domestic water in the SBR have been estimated at 8.08 million cubic metres (mcm) and 105.1 mcm, respectively. The water demand for agriculture has been calculated as 2782.83 mcm. It is observed that the SBR gets 2000–2500 mcm annual runoff from its upper catchments, and the habitated region of the SBR generates additional 1800–2000 mcm annual runoff within its territory. Blockwise water availability from different sources has also been estimated. The research reveals the growing population pressure on agriculture with an average man-cropland ratio of 14 person/hectare land. The highest cropping and irrigation intensity has been observed in the northern blocks where shallow groundwater is available for agriculture. On the contrary, the lowest values have been observed in the southern blocks nearer to sea, due to existence of saline water in shallow aquifers. Available water from 70,000 freshwater tanks and around 8000 shallow borewells are not sufficient to meet the agricultural water demand during the Rabi (winter) and summer seasons. Unavailability of freshwater restricts food production, which endangers the food security of 87.5% of the people in the SBR. To ensure food security in the present changing climatic condition, expansion of irrigation network and harnessing of new water sources are essential. 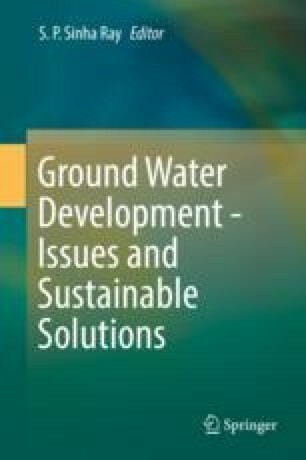 This study emphasizes that rooftop rainwater harvesting in this region has potential to supply additional 45 mcm water which can be used to meet the domestic water demand partially. Large-scale rainwater harvesting, rejuvenation and reconnection of disconnected river channels, artificial recharge within shallow aquifers and desalination of shallow groundwater can be some other major policy options to meet the water demand in the SBR in the future.